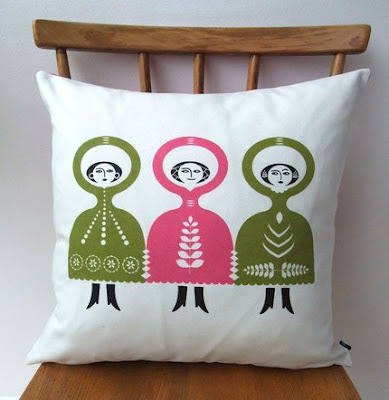 Virginia Armstrong of Roddy & Ginger, today's Mixing Bowl contributor, is a graphic and textile designer living in London who not only creates her own colorful and folksy designs, but also makes gorgeous cushion covers out of vintage fabric. 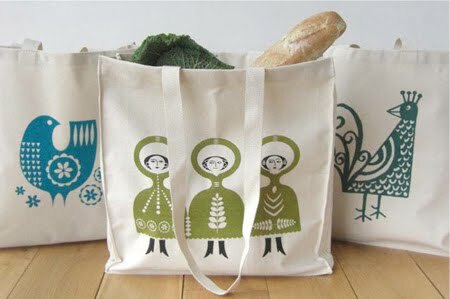 On Virginia's site, you can find tote bags, prints, tea towels, aprons, pillows, and children's clothing, all of which are printed by hand. The first time I saw her work, I was instantly hooked. 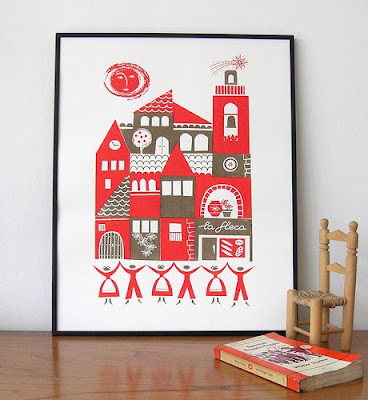 I can't resist her simple and sweet designs, especially the happy Sardana print, which was inspired by a little Spanish village in Catalonia where Virginia has a house. In the lower right-hand corner you can see the only shop in the town, la fleca, or "the baker" in english! 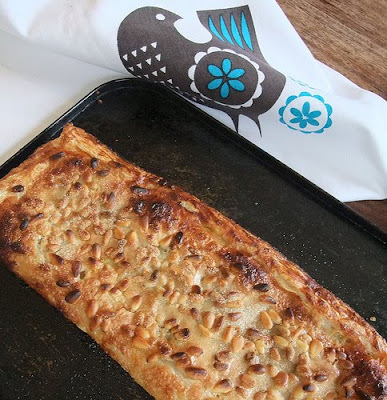 From Virginia: We are lucky enough to have a family house in a sleepy little village in Catalonia not far from the small town of La Bisbal where the speciality is La Bisbalenc – a delicious pastry filled with Cabell d’Angel. Cabell d’angel means angel hair and is the name of the pumpkin jam used to stuff this Spanish treat. It’s a great way to use pumpkins at this time of year. 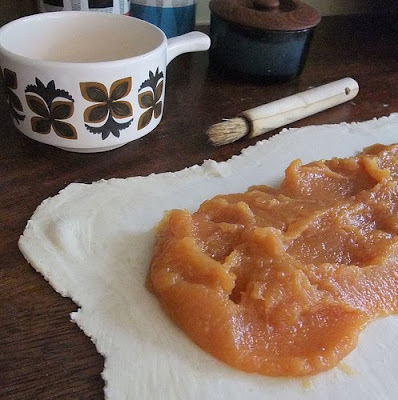 However, I have a tiny quince tree here in London that has just produced a bumper crop so I made quince jam instead – also a Spanish favourite, and it still tastes angelic! 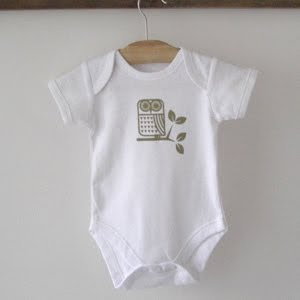 Click here to view the full Roddy and Ginger collection online and here to visit their Etsy site. To check out the Roddy and Ginger blog, click here. Thanks Virginia! 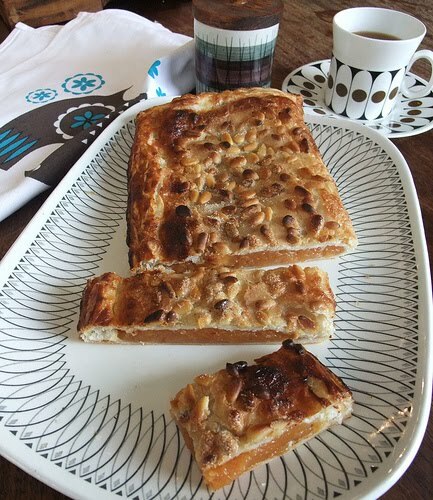 You can find the complete recipe and more delicious pics after the jump. If you need help converting the measurements, click here for a nifty conversion calculator. 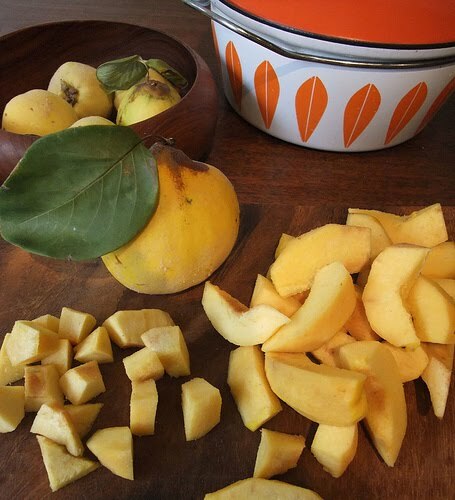 Prepare the quinces or pumpkin by peeling, deseeding and cutting into cubes. Place in a large heavy pan and just cover with water. Bring to the boil and simmer for 15 minutes till soft then process or sieve into a puree. Return the puree to the pan, add the lemon and sugar and simmer uncovered on a low heat stirring often to stop it burning. After about 35 minutes it should be like a thick jam. Cool and store in the fridge, it will keep for up to a week. Roll out the pastry to about 12x14”. Place a thick layer of the jam along one side and paint the edges with egg. 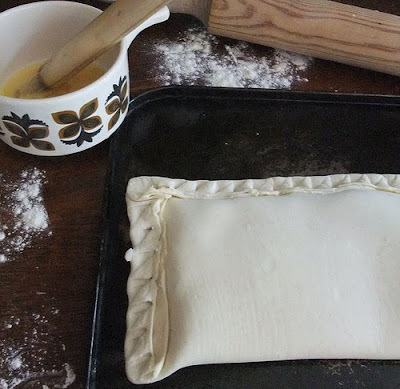 Fold over and seal the edges by folding and crimping – you don’t want a sticky mess in the oven! Prick the top a few times to let the air out and paint it generously with more egg.Sprinkle over a good handful of pine nuts and plenty of sugar. Bake at 200ºc or 400ºf for 15 minutes, keep an eye on it as the sugar can burn. Leave to cool, slice and eat! wow, i couldn't even tell that was puff pastry! awesome recipe. puff is so versatile (and delicious). 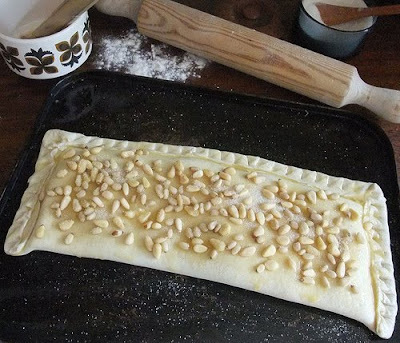 Love the pine nuts sprinkled over the top for extra texture and richness. Yum! This sounds delicious. I love pumpkin, especially this time of year. Winter would sure be good in Barcelona near a bakery!! We just tried La Bisbalenc today with homemade quince jam as the filling and with some whipped cream on top after it cooled from the oven. Outstanding!!! Simply beautiful! Yummm:) Thank you!